DUBLIN, Ireland (CNN) -- Irish voters are going to the polls again Friday -- to vote on a treaty they rejected just over a year ago. 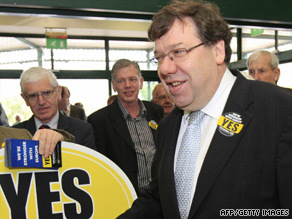 Prime Minister Brian Cowen gets out the 'vote yes' message in Tullamore. But this time round, opinion polls indicate the "yes" campaign to adopt the Lisbon Treaty and its rules for governing an expanded European Union will be successful. The EU has made assurances to Ireland that the Lisbon Treaty will not affect the country's abortion laws or its neutrality and that Ireland will keep a European Commissioner. In the weeks leading up to the vote, Dublin was awash with posters for both sides of the emotional argument. "Yes" posters reminded voters how much Ireland has benefited financially from being inside the European Union. "No" placards questioned whether Ireland will lose its military neutrality, its anti-abortion laws and its minimum wage despite the EU assurances. Just more than half -- 53 percent -- of Irish voters said "No" to the Lisbon Treaty in June 2008, throwing the future structure of the European Union into doubt as all member states have to ratify the treaty before it can be adopted. Lisbon is the plan to modernize the EU's structure after it expanded to 27 members, with most of the new member states coming from Eastern Europe. Ireland has just one percent of the EU's population but its "no" vote effectively stopped adoption of the Lisbon Treaty across the continent. So, the Dublin government is holding another referendum Friday in the hope of this time getting a "yes" vote. Is Europe facing threat from the right? No other EU citizens have been allowed to vote on the treaty as national parliaments have ratified the treaty. And to date only Poland and the Czech Republic governments have held up the final passage of the treaty in their own countries. But Ireland's constitution mandates citizens must be allowed to vote on any major changes to its own governmental structure. A handful of Dublin taxi drivers told CNN they would vote no because they see no reason to give to Brussels the powers that Ireland fought hard to wrestle away from Britain. "No" campaigner Brendan Young, from a group called People Before Profit, put it bluntly: "People having had experience of benign British presence don't want to be going fighting Britain's wars, or anybody else's." But the "no" campaign is a rag bag of groups that have little in common. Young says he is pro-Europe but does not want Irish tax money to pay for Europe's military structure. To illustrate the diverging political viewpoints in the "no" campaign, Young was not happy that the United Kingdom Independence Party was in Dublin and on his side. UKIP is an anti-European Union, British party and it finds itself on the same side as Sinn Fein, the anti-British, nationalist party. Conservative anti-abortion catholic groups also press the "no" case. "When I see the UK Independence Party join up with Sinn Fein and religious extremists, I must be on the right side," laughed Michael Wall, a "yes" campaigner. He said he volunteered to hand out leaflets because he says last year the pro-Lisbon Treaty lobby took a "yes" for granted. He says by talking about what is actually in the treaty -- a document most people last time round admitted they had not read -- he has changed minds. "I have met a lot of people on the campaign who voted no the last time. Voted no out of anger, voted no because of the arrogance of politicians who put their faces on the posters when the issue wasn't about, say, local elections," Wall said. "A lot of people have changed their mind and I think they should be given that opportunity" by getting to vote a second time. But Ireland is going through one of the worst recessions of any developed nation since the 1930s. There are no green shoots on the emerald island. Property prices have collapsed, unemployment doubled in a year and for the first time in nearly 20 years, emigration is back. The government is very unpopular and the business community worries this will influence voting. "The biggest concern is that it will be a "no" on the basis of people's anger about domestic policy issues rather than the treaty itself," says Patricia Callan, of the Small Firms Association. Business is at the fore of the "yes" vote this time around. At the U.S. tech giant Intel, Jim O'Hara, its General Manager of Ireland, said he had to persuade his boss this vote was critical. "I had to go and convince the Intel Corporation," he said. "And quite frankly Paul Otellini, when I spoke to him, the CEO, wasn't that particularly interested in the issues. I convinced him that it was good for Ireland and good for our business in Ireland." Results are not expected until Saturday.